Time management has been on my mind for a while now. Recently I re-read Druckers’ Effective Executive - the second chapter of which, ‘Know they Time’, is devoted to time management. I recommend it highly! For the vast majority of managers that I work with making significant improvements in their time management is quick and easy. Block out at least 2 x 90 minute slots each week when they are going to work – without interruption – on moving that priority forward. It takes no more than that – get time for your priorities on your schedule! This is important because so many managers just hope to fit progress on key priorities around a morass of standing meetings, e-mail and fire-fighting. Weeks slip by without any focus on progressing the priority. Yet once it is scheduled – and the time protected – BINGO! – the priority gets time and progress is made. And while I am at it – unless work is really THE most important thing in your life – take great care about giving up week-ends and evenings to do it. Working longer hours is rarely the key to getting more done. It usually results in getting less done and only serves to slow down the rate of work; why have a sense of urgency to get the job done if you can always stay just another half an hour? If you find that you must work evenings or week-ends then always make sure that you have a firm end-time for the work fixed – and stick to it. Make an appointment with what you love outside of work (family, hobby whatever) immediately after your work commitment and keep it. My diary is littered with 5pm appointments with Danny. Danny is my dog. By having that 5pm ‘appointment’ fixed in my calendar I can get my work done and get away for a bit of me time. Setting ‘hard stops’ like this will force you to use your time effectively. If you want more goodies like this then sign up so you don’t miss a thing! One of the useful tools that Steven Covey gave us was his concept of Four Quadrants in relation to time management. 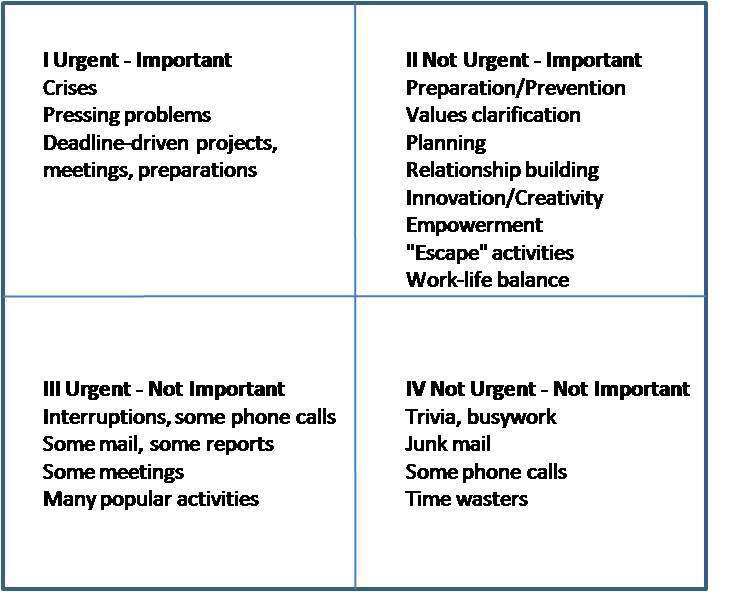 Covey suggested that too many of us spend too much time in quadrant 1 (urgent and important stuff) and quadrant 3 (urgent but not important). Activity in these 2 quadrants comes to dominate working life, with the important but non-urgent stuff of quadrant 2 being relegated to off-sites and other special occasions. And while activity in quadrants 1 and 3 keep us busy they do little to make things better. They just help us to cope with the status quo. One of the benefits of 121s is the opportunity that they build in to focus on a regular basis on quadrant 2 type work. And as Covey pointed out, this is the key to excellence. By building time for Quadrant 2 work into a regular schedule we can start to change the culture of the organisation.